Let’s get this out of the way first – Be Safe! With spring biking season soon here you will be riding on roads with pedestrians, other riders and cars. With more road traffic each year it is possible to have an accident even if you do everything correctly. So protect yourself in the easiest and most comfortable way possible, wear a helmet and review the following tips, wear a helmet that fits. Some riders experience upper body pain while riding on roads. some of the most frequent pain is associated with the upper body, and due to position and fatigue. The position most responsible for this pain is the shrugging of shoulders while riding. 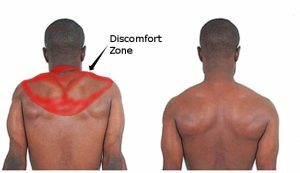 That shrug compresses all the muscles in your neck, shoulders and back and fatigues them needlessly. Fatigue comes into play starting at the hands. A firm grip on your bars is a great way to keep control of your bike, but if you hold on too tightly you can prematurely fatigue your hands, arms and shoulders. Rather than shrugging your shoulders and squeezing the bars into dust, try to relax your back (see picture) and shoulders and hold the bars firmly. By relaxing your upper body, you will preserve strength throughout your ride, making for mile after mile of pain free riding. Cars, pedestrians, other riders, potholes, grates, as well as traffic lights and signs need your attention while riding on roads. The best way to keep yourself safe and in control is to direct your attention outside of your immediate area. Try to focus thirty or forty feet down the road rather than right in front of you. If you need to change direction or stop quickly, thirty feet is about the minimum distance you need to react. As you ride more, you will get comfortable with what your reaction time is. Additionally, knowing your route in advance leaves your mind free to concentrate on the things going on in front of you. Your front brake is your most powerful tool in stopping. As a new rider we get taught that the best way to stop is to use both brakes evenly and that if we use too much front brake we are prone to crash “over the bars”. While going “over the bars” is a real concern it can be combated with a little practice. Not only can going “over the bars” be combated, but you will learn to stop your bike more effectively in the case of emergency. As you begin to stop, your weight shifts forward and adds more pressure to the front wheel. This pressure can do two things. If you brace properly with your arms, that pressure to the front wheel increases traction and stops the bike. If you do not support yourself moving forward, the increased pressure to the front wheel turns into a fulcrum. Practice stopping by finding a piece of unoccupied road you are comfortable with. Get up to speed and begin applying only the front brake (see picture below). Be cognizant about bracing yourself with your arms while stopping. Do this a little at a time, each successive stop should be a bit more power. Stop once you are applying enough power to stop, while the rear wheel is slightly lifting. The rear brake is far more susceptible to skidding than the front. While skidding a tire, you are not in complete control or reducing speed effectively. The bright side, is that a rear wheel skid is far more controllable than a front wheel skid. In wet, loose, or slippery conditions, a rear brake can be safer to use. The rear brake is also great to control your speed by small amounts. The ideal time to use both brakes is during turning. As you turn and brake you are sharing traction between turning and stopping the bike. It is very important to try and control your speed before turning rather than in the turn. Your chances of lifting 1000 pounds once is pretty slim, but you might be able to lift 100 pounds ten times and can more than likely lift 20 pounds 50 times. Riding a bike is the same way. If you try to shove the bike up a hill in your hardest gear the chances of making it are slim. Shifting your bicycle into an easier gear and pedaling faster (higher cadence) will propel you up almost any hill. Higher cadence riding is just one way to be more efficient on your bicycle. Riders above are both working too hard. The riders below, are drafting well. Another way to be more efficient is to use the work of others to your advantage. At lower speeds most of your effort goes to moving your own mass, but as your speed increases, more and more of your effort goes to moving the air around you. In fact, air resistance grows exponentially at a rate of about 7 mph. That said, the amount of effort required to move your bike at 14 mph is twice as much as at 7 mph. Also as you approach 21 mph that effort is four times more than going 7 mph. A way to save energy is to ride behind another rider who has already moved the air (see above). By drafting, you are riding in the slipstream of another rider. 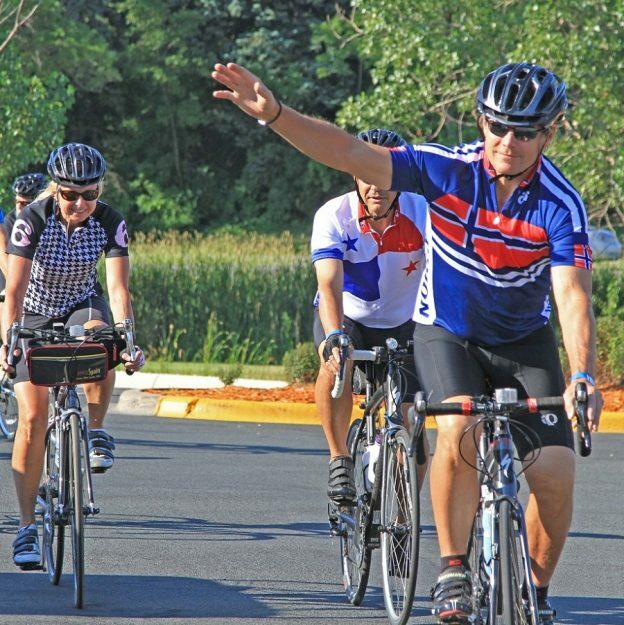 To draft, try to ride at the same speed ahead of you, and keep your front wheel within two feet of their rear wheel. Be sure to ride with the materials needed to get home. Train yourself to fix a flat and carry enough food and water to keep your energy up throughout the ride. Consider carrying packable rain gear with you as well. If you liked this info, take a look at our Mountain biking hacks also. 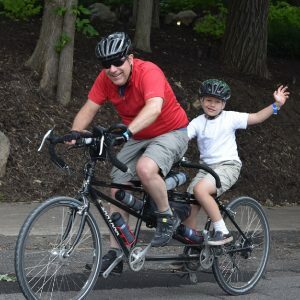 This entry was posted in News and tagged #nextbikeadventure, adjusting a bike helmet, be seen on a bike, Bike Cadence, Bike comfort, Bike control, bike draft, Bike hacks, bike helmet comfort, bike maps, discomfort zone, free bike maps, front bike brake, kids’ bike helmets, rear bike brake on April 15, 2018 by John Brown.